I really enjoy presenting workshops where I not only share active play products but also play props or toys that can be made using recyclables. A favorite product is the Rainbow Dancing Wrist Bands from Discount School Supply®. I prefer to use streamer ribbons that are not connected to a long stick. The stick can be too cumbersome for little hands and a safety hazard as well. Streamer Ribbons can be an easy “Do It Yourself” (DIY) project. In previous posts I gave instructions on how to make a Floppy Flipper, Bread Bag Jump Rope, and a Six-Pack Net. In this post, I will share with you on how to make a streamer ribbon using one plastic ring and some flagging tape. Turn trash into toys for active play indoors or outdoors! 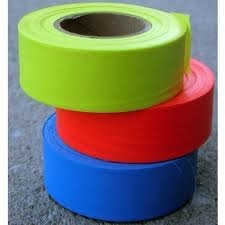 Colored flagging tape or surveyor’s tape: a non adhesive marking ribbon used for surveying, mapping, tagging, roping off areas or any other marking application. Available in a wide variety of bright and bold colors. 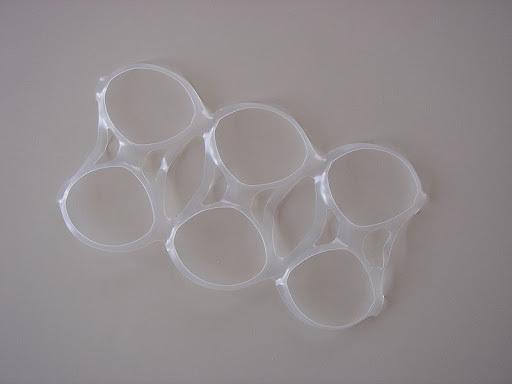 Cut plastic rings apart, making sure to keep the rings intact. Cut 3-4 three foot pieces of different colored flagging tape and tie each piece to the plastic ring. Make two DIY Streamer Ribbons–one for each hand! Start the music and bodies start moving. 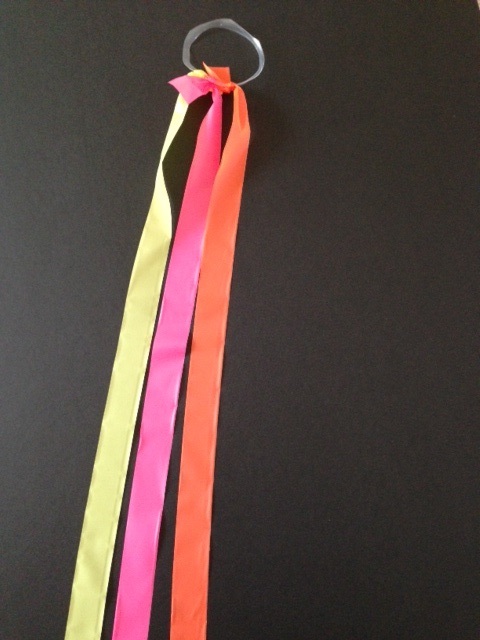 With a streamer ribbon in their hand, encourage the children to dance and move about freely in the open space. Suggest to the children that they move the streamer fast, slow, high, low, side to side, and all around. Tell them that when the music stops, they are to stop and freeze (stand motionless like a statue). When the music starts again, children resume dancing. Ask children to follow along as you move the streamer across the front of your body, circle the streamer in front of your body like a Ferris wheel or circle it over your head like a helicopter blade. Try to trick the dancers by starting and stopping the music quickly. They love the element of surprise! Use all different types of music: fast, slow, classical, rock, salsa. When playing a slow song, suggest the children twirl, leap and float to the music. Streamer Ribbon dancing promotes cross-lateral movements (crossing the midline) and develops body and space relationships, agility, flexibility, and listening skills. On your mark, get set, get ready, GO! Have children run from one boundary to another with their Streamer Ribbon in their hand. They will ask to do it again and again. Running is a locomotor skill and a form of vigorous physical activity that increases the heart rate while improving fitness. Set up boundaries using ropes or cones in the available space. Each child tucks a Streamer Ribbon into their waistband behind their back. The ribbon is now their tail. The game starts when the music starts and the children run in the available space. The game is played like tag, but instead of tagging each other, children pull each others ribbons out of their waistbands and drop them on the ground. The child whose ribbon is pulled picks up his streamer ribbon (tail), goes to “the tail repair area” (a designated spot, i.e., door, tree, etc.) to replace the ribbon in their waistband. Once the ribbon is secure in their waistband, the child returns to the game and resumes pulling tails (ribbons). The game ends when the music stops. This group game promotes cooperative play, vigorous physical activity and lots of laughter!